The Strangest Man: The Hidden Life of Paul Dirac, Mystic of the Atom (Basic Books/Perseus Book Group), written by Graham Farmelo, was the winner of the Costa Book Award for Biography and the Los Angeles Times Book Prize for Science and Technology, in the year 2009 of its publication. This book was also selected as one of the best books of 2009 by The Economist, The New York Times Book Review and Amazon.com. The Japanese edition of the book was published by Hayakawa Shobo, Tokyo, in September 2010. The translator was Michiyo Yoshida. The Japanese title is not the literal translation of the original but means, "The Sea of Quantum, Dirac's Abyss: The Highly Gifted Physicist's Glorious Achievements and Reticent Life." Fumiko Yonezawa's review of the Japanese edition has appeared in The Akahata. This is the first review of it I have seen in the mass media. Fumiko Yonezawa is Professor Emeritus of Keio University, the first woman President of the Physical Society of Japan and one of the laureates of L'ORÉAL-UNESCO for Women in Science Award 2005, for her pioneering theory and computer simulations of amorphous semiconductors and liquid metals. The Akahata or Shimbun Akahata (literal translation, Newspaper Red Flag) is the daily organ of the Japanese Communist Party in the form of a national newspaper. Started in 1928, Akahata has a 16-page daily edition and a 36-page Sunday edition, and the total circulation is 1.68 million (quoted from "Shimbun Akahata," Wikipedia, 7 December 2010 at 20:41). I subscribe to two newspapers in order to get deep and balanced view of politics in Japan; one is the "national newspaper," The Asahi, and the other is this Akahata. The latter often carries more excellent articles not only in politics but also in science and culture than "national newspapers." The review by Yonezawa has been printed on one of two-page "Books" column of the issue of Sunday, December 26, 2010, of the daily edition. The title of the review in literal translation is "The group of scientists depicted elaborately," though the treatment of the book is centered on Paul Dirac. First, she introduces Dirac as a British theoretical physicist and one of the contributors to the establishment of quantum mechanics. Then, she praises his mathematical method of describing quantum mechanics as the most beautiful and his book Quantum Mechanics as the most outstanding among similar books. Especially, she notes that Dirac's book does not have any diagrams, includes a minimum necessary number of equations and many explanations by words like a book of philosophy. She even devotes a paragraph to describe how she enjoyed Dirac's book in her student days, being enchanted by and intoxicated with the beauty of the system he developed. 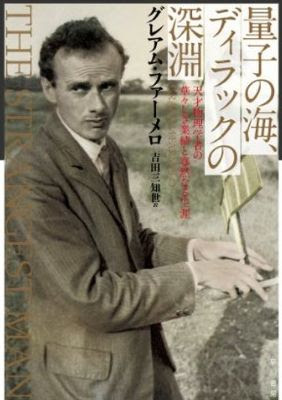 Next comes a brief introduction of Dirac again (namely, "he got successful results in young days and received Nobel Prize at the age of 31"), and the book being reviewed is mentioned as the biography of Dirac, consisting of more than 600 pages in the Japanese edition. Yonezawa writes that she liked the detailed depictions of the group of scientists in the ages of the formation of quantum mechanics and succeeding to it (the title of the review comes from her words here). She mentions about Dirac's extreme reticence and infers that only the truth of nature and equations would have been swirling in his brain. She quotes the following episode as contrary to this character of Dirac: When Peter Kapitza, a scientist friend of his from Russia, was forbidden to depart from the Stalinist Soviet Union, Dirac was busy trying to collect signatures from physicists for the request of release. Finally, Yonezawa refers to Dirac's belief, "Physical laws must mathematically be beautiful," and concludes that everything of the physicist Dirac is described in this book. This is a relatively short review but invokes the readers' interest in the person of Dirac quite well so as to make them want to read this book. Note added later: By the way, I found the book, Radioactive: Marie & Pierre Curie: A Tale of Love and Fallout" by Lauren Redniss, among Amazon.com editors' picks for the best books of December 2010. I like Richard Rhodes's words of review, "Absolutely dazzling. Lauren Redniss has created a book that is both vibrant history and a work of art. Like radium itself, Radioactive glows with energy." Did Wiener say these words? On reading this, I wondered if these words were actually said or written by Wiener; and asked Karin Silvia about the source of the words. She replied that three Web sites showed this quote as credited to Wiener but that the source was not given. My reason for wondering was this: The words well describe the current state of theoretical physics, but Wiener died in 1964. Therefore, I made a search at the Web sites of Google books and amazon.com; and found that the source of the above quote was the following: Norbert Wiener, "I am a mathematician: the later life of a prodigy; an autobiographical account of the mature years and career of Norbert Wiener and a continuation of the account of his childhood in Ex-prodigy" (Gollancz, 1956) p. 109. Physics is at present a mass of partial theories which no man has yet been able to render truly and clearly consistent. It has been well said that the modern physicist is . . . This indicates that the quote Karin Silvia used is what had been said among physicists in the days when Wiener wrote the book. Thus, I confirmed that the quote was not Wiener's own words. However, the reason I supposed was totally wrong. When I informed her of this finding, Karin Silvia thanked me for information and wrote also this: She thought that the quote was Wiener's own words because one of the Web page she saw it was "Mathematical Quotes" at the site of the Department of Mathematics, University of Pittsburgh. Doubting is often useful for learning, even if with wrong reasoning. I thank Karin Silvia Franzoni Fornazier for her permission to use our written conversation in this essay. Hideki Yukawa described the climax of the development of his meson theory in his autobiography Tabibito . However, this description is contradictory to the record of his academic presentation made more than a year before the date of climax. Study on this problem has revealed that two factors were responsible to this contradiction. The crucial point came to me one night in October. The nuclear force is effective at extremely small distances, on the order of 0.02 trillionth of a centimeter. That much I knew already. My new insight was the realization that this distance and the mass of the new particle that I was seeking are inversely related to each other. Why had I not noticed that before? "October" in this quote means that of 1934 according to the paragraph that precedes it. Note that his new insight means the realization of the inverse proportionality of the effective distance of the nuclear force (the force that binds neutrons and protons in the nuclei) to the mass of the new particle that mediates this force. Hereafter, we call this inverse proportionality distance-mass relation. From the fact that the electron has the rest mass, we consider that the strength of the interaction decreases rapidly, as the distance between the neutron and the proton becomes large compared with h/(2πmc). Here, we find that Yukawa used the distance-mass relation already in 1933. Thus, it is contradictory to call the realization in 1934 of this relation "my new insight". We guess that the following two factors were responsible to the above contradiction. 1. Hisao Sawano of the Assahi Shimbun Company helped the publication of the Japanese version* of Tabibito by editing Yukawa's manuscript . If Sawano's editing had been to such an extent as to change Yukawa's original version into more dramatic one here and there, then Sawano must have modified the passage about the climax without thinking that his change might contradict Yukawa's academic record. 2. In the work of his 1933 presentation, Yukawa treated the possibility that the electron might be the mediator of the nuclear force. This hypothesis included difficulties related to the spin and statistics of the electron. Therefore, Yukawa abandoned the hypothesis soon later. At the same time, he might also have discarded the distance-mass relation. If so, Yukawa had to rediscover it for completing the paper on the meson theory. There are two accounts that support factor 1. One of them is Yukawa's passage in Ref. 4. He describes there that he finished writing the last section related to the discovery of the meson theory just a few hours before his trip to Europe. Perhaps, Yukawa regularly checked the changes made by Sawano in order for those not to be contradictory to facts. As for the last section, however, it is quite possible that Yukawa's trip to Europe made such a check impossible. One of the questions addressed to him was this: "We hear that the Japanese people study sitting on their legs in a straw-matted room. Did you, Dr. Yukawa, write your paper sitting on your legs or sitting on a chair at the Western-style desk?" Hideki thought a little while and said, "I did in neither of those ways. I put my thoughts together at night in bed." This is true. Hideki wrote the paper that brought him Nobel Prize after he had kept thinking many nights at the age of 27 in the year of Shōwa 9 [Note by the translator: 1934]. This story seems to have wrongly come across to Japan. Thus, in Japan they believe that the idea flashed to him in the middle of a night. This passage makes us think that the description in Ref. 1 about the sudden coming of the crucial point one night was a modification by Sawano, because it resembles the wrong information conveyed from Sweden to Japan. Further, we can consider that Sumi here denied the modified description indirectly. However, we should note Sumi's possible denial refers, in a strict sense, only to "that the idea flashed to him in the middle of a night." This is not relevant to the essential point of the contradiction, because what is contradictory is the content of the "new insight." This content is highly technical and possibly beyond Sawano's ability of rewriting. Therefore, factor 1 alone cannot be the cause of the contradiction. In the manuscript of the presentation of April 1933, Yukawa corrected his idea in the abstract to read "the actual calculation does not yield this result." Further, in the draft "Bose electron theory" written almost at the same time as the above manuscript (it had been preserved in the file "Manuscripts of seminars and colloquia, 1934–1935"), he wrote, ". . . the term including the Compton wavelength of the electron appears as a kind of phase factor, . . . and, as a consequence, we cannot say the force decreases rapidly with increasing distance." The above quote clearly shows that Yukawa once fully discarded the distance-mass relation and that the rediscovery of it was necessary. One night in early October, a thought flashed through my mind. The nuclear force has only an extremely short effective range. It is on the order of 0.02 trillionth of a centimeter. This has been known since earlier time. What I noticed is that this effective range and the mass of the new particle that accompanies the nuclear force would be inversely proportional to each other. Why did I not notice such a thing until then? In early October, a thought came to my mind. . . . Why did I not examine this again until then? Then, the passage is a less dramatic depiction of the development of the meson theory but does not contradict to his earlier use of the distance-mass relation. Hideki Yukawa's own autobiography was translated into English, French and German. Therefore, the wrong version of the story modified by Sawano has become famous world over. This is unfortunate. Sumi Yukawa's account quoted above should be informed widely. * The Japanese version of Tabibito first appeared as a series of 112 stories in Asahi Shimbun from March to July, 1958. ** The title Kuraku-no-Sono was taken from the street name in Nishinomiya City, where Hideki and Sumi Yukawa lived in the years shortly after their marriage. It has the meaning of "the garden (sono) of joys and sorrows (kuraku)." *** See also the same passage in the German version : Eines Abends Anfang Oktober hatte ich mit einem Mal die richitige Idee. Die Kernkraft hat eine äußerst kurze Reichweite: nur 2/10-billionstel Zentimeter. Das wußte ich schon vorher. Was ich nun bemerkte, war vielmehr, daß die Reichweite und die Masse der zur Kernkraft gehörenden neuen Teilchen zueinander in umgekehrter Proportion stehen müßen. Warum war ich nicht schon eher darauf gekommen! H. Yukawa, Tabibito (The Traveler), translated by L. Brown and R. Yoshida (World Scientific, 1982) p. 202. H. Yukawa, Sūbutu-gakkaisi, Vol. 7, No. 2 (1933) quoted in Nihon-no Buturigaku-shi (History of Physics in Japan) (Tokai University Press, 1978) p. 319 (in Japanese; English translation of the quoted passage by the present author). H. Yukawa, Atogaki (Afterwords) in Tabibito, (Kadokawa, 1960) (in Japanese). H. Yukawa, Hon-no Naka-no Sekai (The World in Books) (Iwanami, 1963) p. 182 (in Japanese). S. Yukawa, Kuraku-no-Sono (Kōdansha, Tokyo, 1976) pp. 349–350 (in Japanese; English translation of the quoted passage by the present author). M. Kawabe and M. Konuma, Butsuri Vol. 37, p. 265 (1982) (in Japanese). Hideki Yukawa: Tabibito - Ein Wanderer, Grosse Naturforscher Band 48, ed. Erwin Müller-Hartmann, transl. Claus M. Fischer, p. 175 (Wissenschaftliche Verlagsgesellschaft, Stuttgart, 1985). Please read the Second Revision instead of this article, which is retained only as the record of the processes of my solving the mystery. My new insight was the realization that this distance [the effective range of the nuclear force] and the mass of the new particle that I was seeking are inversely related to each other. Why had I not noticed that before? From the fact that the electron has the rest mass, we consider that the strength of the interaction decreases rapidly as the distance between the neutron and the proton becomes large compared with h/(2πmc). In the work of the above presentation, Yukawa treated the possibility that the electron might be the mediator of the nuclear force between the neutron and the proton. This hypothesis included difficulties related to the spin and statistics of the electron. Therefore, Yukawa totally abandoned the hypothesis later together with the relation of the distance and the mass of the particle that would mediate the nuclear force . Did this abandonment make it necessary for Yukawa to rediscover the relation? If so, this explains the contradictory remark of his "new insight." We find another possible explanation of the contradictory description in the process of the making of Yukawa's autobiography. Hisao Sawano of the Assahi Shimbun Company helped the publication by editing Yukawa's manuscript . If Sawano's editing had been to such an extent as to change Yukawa's original version into more dramatic one here and there, the passage that began with "My new insight" might have been Sawano's modification. To eliminate the expression different from the fact, Yukawa, perhaps, regularly checked the changes made by Sawano. However, Yukawa finished writing the last section related to the discovery of the meson theory just a few hours before his trip to Europe . Thus, it is quite possible that Yukawa did not check Sawano's modification of that section. Both Yukawa and Sawano are now in heaven. Thus, the mystery of the "new insight," i.e., which of the above two explanations was the case, does not seem to be solved easily. However, we have another clue to solve this problem. Here Sumi clearly denies the story in Ref. 1 of the "new insight" that came suddenly. Therefore, the second possibility given above, i.e., the contradiction is due to Sawano's modification, should be regarded as the case. Hideki Yukawa's own autobiography was translated into English, French and German. Therefore, the wrong version of the story modified by Sawano has become famous world over. This is unfortunate. Sumi Yukawa's account quoted above should be informed widely. * The title Kuraku-no-Sono was taken from the street name in Nishinomiya City, where Hideki and Sumi Yukawa lived in the years shortly after their marriage. It has the meaning of "the garden (sono) of joys and sorrows (kuraku)." S. Yukawa, Kuraku-no-Sono (Kōdansha, Tokyo, 1976) pp. 349–350 (in Japanese). The Solution to the Mystery of Yukawa's "New Insight"
According to his autobiography , Yukawa arrived at a crucial point in the development of his meson theory one night in October 1934 by getting a "new insight." It was about the relation between the effective range of the nuclear force and the mass of the new particle he was seeking. However, this contradicts the fact that he used this relation already in 1933. There are two possibilities to explain the contradiction: (1) Yukawa once thoroughly abandoned the idea in which he used the relation, so that he had to rediscover it. (2) The description in Ref. 2 is the change made by Hisao Sawano of the Asahi Shimbun Company, who helped the publication of the autobiography by editing Yukawa's manuscript. Both Yukawa and Sawano passed, and the mystery of the "new insight," i.e., which of the above two explanations was the case, cannot be solved easily. This passage by Sumi clearly denies the story in Ref. 2 of the "new insight" that came suddenly. Therefore, the possibility (2) given above should be regarded as the case. Hideki Yukawa's own autobiography was translated into English, French and German. Therefore, the wrong version of the story modified by Sawano, "The crucial point came to me one night in October. … My new insight was …" has become famous world over. This is unfortunate. Sumi Yukawa's account quoted above should be informed widely. The Mystery of Yukawa's "New Insight," Ted's Coffeehouse (February 27, 2010). S. Yukawa, Kuraku-no-Sono (Kōdansha, Tokyo, 1976) in Japanese. The Novel-winning physicist Richard P. Feynman was born on May 11, 1918. In May, therefore, he is "the physicist of this month." The May-2010 issue of APS News  carries, on its first page, the sketch of a young lady under the title, "Who created this drawing?" The second and last sentence of its caption makes the reader go to page 5. On page 5, we find a short article with a witty title, "Feynman drew more than diagrams," and a photo. The photo shows four more drawings and two persons, APS President Curtis Callan and his colleague Igor Klebanov. The article explains the followings: The drawing on page 1 was done in 1985 by celebrated Caltech physicist Richard Feynman and that it is one of several that are now at Princeton in the possession of Callan. The works were acquired in the mid-eighties by Princeton, where Feynman had been a graduate student, and were kept in the office of the late Sam Treiman, from whom Callan received them. In the opinion of experts, Feynman was at least as good at drawing as Rembrandt was at physics. This sentence seems to imply in a humorous manner that Feynman's drawings are pretty mediocre from the viewpoint of experts. To be sure about this, we have to see to what extent Rembrandt studied physics. In the description of Wikipedia , we find that Rembrandt attended Latin school and was enrolled at the University of Leiden. However, he soon apprenticed to painters and then opened a studio at the age of 18 or so. Therefore, it might be safe to conclude that Rembrandt learned little about physics. From cautiousness, I made Internet search by the combination of the words Rembrandt and physics; and found the article  entitled "The Rembrandt Solution" (the report does not include the word "physics," but one of comments on it does). It is about a technique developed by Rembrandt and other painters and called countershading. This technique creates the illusion of greater dynamic range of light intensities in their paintings than in real scenery. Illusion is the sensory distortion of the physical world. In order to utilize the effect of illusion, painters should know about the relationship between the nature of human senses and physical signals. Then, Rembrandt must have had sharp physical insight. Namely, Rembrandt's drawing technique makes us think that he was fairly adept at physics. How can we argue about Feynman's goodness at drawing from his physics, conversely? Does his famous invention of Feynman diagrams prove the quality of his artistic skill? This seems to be difficult, though the invention at least indicates that his method of thinking was geometric as well as analytic. Is there any decent idea about this? I expect comments from readers. APS News, Vol. 19, No. 5 (2010). "Rembrandt," Wikipedia, the free encyclopedia (6 May 2010 at 00:13). G. Randall, "The Rembrandt solution: What painting’s grand masters can teach today’s digital photographers" (2009). On the basis of his thought about Dalian, Inoue made a drama entitled "Enshō and Shinshō." Komatsuza made the first performance of this drama in 2005. It is about this story: Raconteurs Kokontei Shinshō and San'yutei Enshō went for performances in Manchuria** during the war time and were induced to stay in Dalian because of Japan's defeat. They had to do different and difficult jobs to live there for 600 days before coming back to Japan. The last passage of Inoue's essay is as follows: 'The word "Dalian, the Dream Town" that entered deep in me as a child would not disappear until my death while its meaning is changing." One of the changes was due to his concern about Chinese people who had to live on the outskirts of Dalian when the city was part of Japan's borrowed land. Here we find Inoue's pacifism that made him one of initial members of the Article 9 Association. Praying for his peaceful sleep in heaven, I wish to follow his footsteps in the efforts to keep Article 9*** of the Constitution of Japan and extend the renunciation of war all over the world. * Dalian is a beautiful port city in the Northeast China. It was in the region of the land borrowed by Japan until August 1945, the time of Japan's defeated in the second World War. ** The historical name of the present Northeast China. *** 1) Aspiring sincerely to an international peace based on justice and order, the Japanese people forever renounce war as a sovereign right of the nation and the threat or use of force as means of settling international disputes. 2) In order to accomplish the aim of the preceding paragraph, land, sea, and air forces, as well as other war potential, will never be maintained. The right of belligerency of the state will not be recognized. H. Inoue and Komatsuza, ed., Hisashi Inoue's Dalian (Shōgakukan, 2002). The ninth (sometimes the eighth or tenth) day of the month is the day for the petition campaign of our "Fukuizumi-Ōtori Article 9 Association (FOA9)." The FOA9 is one of about 7500 local and office groups that support the Article 9 Association. In the morning of April 9, 2010, I went for the campaign together with colleagues of FOA9 and shouted through a microphone, "Hisashi Inoue, Kenzaburō Ōe, the late Shuichi Kato and others established the Article 9 Association. Article 9 of the Japanese Constitution declares the renunciation of war as a means of settling international disputes. The purpose of the Association is to keep Article 9, shine its light upon this turbulent world and join hands with the peace-seeking citizens of the world," and so on. At the Vancouver Winter Olympics, Yu-na Kim of South Korea took the gold medal of women's figure skating competition with a world record score; and Mao Asada of Japan, the silver. Both of them played beautifully and are only 19 years old. Further, they have been rivals each other since quite young days. Thus, their rivalry will perhaps continue through coming years. This reminds me of the relationship between Hideki Yukawa and Shi'nichiro Tomonaga. Before his publishing of the paper on the meson theory, Yukawa had the days of slowdown in his research at the Department of Physics, Osaka University. Then Hidetsugu Yagi, the then Head of the Department and known by Yagi antenna, said to him, "We had the plan of recruiting Tomonaga but your brother's request compelled us to adopt you. Therefore, we should be in trouble if you do not work harder than Tomonaga." These words stimulated Yukawa soon to complete the research on the prediction of the existence of the meson (this story has been translated and adapted from ). He got Nobel Prize in Physics for that work in 1949. Tomonaga shared the same award in 1965 with Julian Schwinger and Richard Feynman for their work in quantum electrodynamics. I also had some rivals in studying during my schoolboy days. They were mostly girls. Among them, one has been the enduring rival, though our specialties have been quite different. She studied Japanese literature in Edo period and is now Professor Emeritus of the University of California, Santa Barbara, while I am a little proud of publications in many different academic journals ranging from physics to psychology. I rarely meet her or exchange messages with her but am grateful to her for continued rivalry. Note added later: Mao Asada beat Kim Yu-na to win her second title at the World Figure Skating Championships held in Turin, Italy, on March 27, 2010. R. Utiyama's writing, quoted in: "Light" into after-war darkness, Asahi Shimbun, special pages for its 120th anniversary (February 13, 1999) in Japanese. On February 20, the column of the Asahi Shimbun, "Tensei jingo," treated the nearing of spring. The column began by the question, "What does ice become when it melts?" This was a question in a science test at a primary school in Japan. The teacher expected the answer, "water." However, the question written in Japanese was rather vague, because it was close to this: What does it become when ice melts? Thus, there was a story that a child wrote the answer, "spring." The author of the column wrote this story once before, without being sure of its veracity. However, the author received a letter from a lady reader, who had been in Supporo, a snowy large city in Hokkaido, as a child. The letter included a multicolor photocopy of a science test. In fact, it was of sepia color, showing the oldness of the test paper. One of the test question was "What does it become when snow melts?" The answer written in pencil was "The ground appears and it becomes spring." The teacher did not consider the answer as correct, and her overall test score was 85 out of 100. The reader wrote that her late mother had held on the paper and that she found it among the belongings left by the latter. If I were a science teacher who asked the aforementioned question, I would have regarded the poetic answer of "spring" correct. Following the conventional wisdom only, we cannot make scientific discoveries. For fostering scientific mind, teachers should put much importance on children's original answers. Note: Usually the English version "Vox Populi, Vox Dei" of the "Tensei jingo" column appears online soon after the publication of the Japanese version. However, the English version of the article here mentioned appeared nine days later (March 1) with the title "Hidden buds stir, eager for spring thawing." Thus, I prepared the story included in it by my own translation from the Japanese version, borrowing some expressions from the official English translation after finding it but retaining the others as prepared. The explanation of the vagueness of the relevant question, when expressed in Japanese, is mine. The Mystery of Yukawa's "New Insight"
The Mystery of Yukawa's "New Insight" (Revised). We find another possible explanation of the contradictory description in the process of the making of Yukawa's autobiography. Hisao Sawano of the Asahi Shimbun Company helped the publication by editing Yukawa's manuscript . If Sawano's editing had been to such an extent as to change Yukawa's original version into more dramatic one here and there, the passage that began with "My new insight" might have been Sawano's creation. To eliminate the expression different from the fact, Yukawa, perhaps, regularly checked the changes made by Sawano. However, Yukawa finished writing the last section related to the discovery of the meson theory just a few hours before his trip to Europe . Thus, it is quite possible that Yukawa did not check Sawano's modification of that section. Both Yukawa and Sawano are now in heaven, and the mystery of the "new insight," i.e., which of the above two explanations was the case, cannot be solved easily. Read the continuation of this article: The Solution to the Mystery of Yukawa's "New Insight"
The following is the outline of my talk to be delivered at Himeji Kyoyukai meeting on February 18, 2010, in Himeji. The Nobel-winning physicist Hideki Yukawa developed the theory of elementary domains for particle physics together with his coworkers in his later years [1, 2]. In the preface of a book , he writes that the important factor that led him to the idea of this theory was the words of the Chinese poet Li Po (701­­–762), "Heaven and Earth are hotels for everything, and days and nights are travelers of hundreds of generations." He also writes that scientific research and literature are not separate things for him. Yukawa also writes in a textbook on particle physics  that Li Po's words mentioned above was one of the motivations that brought his unconscious idea about the elementary domains to his consciousness. While being rather lengthy for introducing the concept of the elementary domains in a textbook, the paragraphs including the above words are considered the valuable record of Yukawa's processes of thinking. In his lecture on experimental nuclear physics, Kiichi Kimura, a classmate of Yukawa's at Kyoto University, told us that some words in the Taoist book Zhuangzi might have been a hint on Yukawa's meson theory that brought him the Nobel Prize. I do not remember the words Kimura quoted from Zhuangzi. In his 1961 essay  on Zhuangzi, however, Yukawa writes that he had read Taoist books Zhuangzi and Laozi in his middle school days, but was forgetting philosophical thoughts in them for many years after that. This means: When he was thinking about meson theory, Yukawa was forgetting Zhuangzi. Thus, the words of Zhuangzi Kimura mentioned had not been a direct hint, at least, on the idea of the meson. It was reported  that the meson theory had been motivated by the occasion of the childbirth of Yukawa's wife. Namely, the judo expert Sachio Ashida remembered to have been told in a commuting tramcar by Yukawa, "A baby can exert an attractive force between the parents. There may be a similar existence in the nucleus." I suppose that this was Yukawa's jocular explanation of his idea for the layperson. Yukawa should have gotten the idea of the meson from the study of earlier papers by Werner Heisenberg and Enrico Fermi together with the analogy of the electromagnetic field mediated by the photon. Note here that he used a good analogy. In his essay mentioned above , Yukawa writes that he reminded himself of an allegory in Zhuangzi when he was thinking about something at a deeper level than "elementary particles," which amounted to more than 30 kinds those days. The allegory was about the king who lacked all the seven holes in the face, i.e., ears, eyes, nostrils and a mouth, and was named Chaos ("Konton" in Japanese). The underdeveloped state of the king was appropriate for Yukawa to express his idea of something at a deeper level. Yukawa also liked the following words from Zhuangzi: "On the basis of the beauty of Heaven and Earth, we arrive at the reason of everything." He made these words in Chinese characters use as a watermark of the invitation letter for "International Meeting on Elementary Particles: The Thirtieth Anniversary of the Meson Theory" . To develop a new theory in the field of particle physics, it is necessary to have good mathematical skill of formulating equations to express a physical model, as well as strong imaginative power to think of a new model. One of the important device with which Yukawa cultivated the latter ability should have been Chinese classic literature, which includes a lot of allegories and helps one to develop thinking by the use of an analogy. Thus his reading of Chinese classic literatures in his young days was useful not only directly for the idea of elementary domains, but, quite possibly, also indirectly for the idea of the meson. Y. Katayama and H. Yukawa, "Field Theory of Elementary Domains and Particles. I" Progress of Theoretical Physics Supplement No. 41, p. 1 (1968). Y. Katayama, I. Umemura and H. Yukawa, "Field Theory of Elementary Domains and Particles. II" ibid. p. 22 (1968). H. Yukawa, Auto-selection of Hideki Yukawa's Essays Vol. 5 (Asahi-shimbun, Tokyo, 1971) [in Japanese]. H. Yukawa, Unified Theories of Particles, in Iwanami Lectures: Foundations of Modern Physics, Vol. 11, H. Yukawa and Y. Katayama, ed., p. 563 (Iwanami, Tokyo, 1974) [in Japanese]. H. Yukawa, Zhuangzi, in Auto-selection of Hideki Yukawa's Essays Vol. 3, p. 363 (Asahi-shimbun, Tokyo, 1971) [in Japanese]. Personal connections in Japan: The spirit of Judo (8), Asahi-shimbun, Evening issue (May 25, 2006) [in Japanese]. The 30th anniversary of Meson theory (1), Asahi-shimbun (September 20, 1965) [in Japanese].